Unorganized, structure less and monotonous content can have negative impact on your website. Important to note, duplicate content is highly toxic and is often penalized by search engines. Create high quality stimulating content with rich but simple keywords as it helps to rank high up in search results. Lack of product descriptions and other information not only has an impact on your SEO but also impacts the customer experience. We at i95Dev recommend adding as much description and quality content (like images, videos, etc.) to your product. Also it is important to create content customized for your customers and avoid reusing the manufacturer’s product description on your website. Customers love reading reviews of products online before making a purchase. Product reviews in your website helps improve sales. But along with that, product reviews from customers brings in unique content and keeps the page live which helps to top the search results. Read our blog Leveraging Reviews for Your E-Commerce Success for more information on how reviews can help you drive ecommerce success. Customers prefer to see the photos of what they are about to purchase; so i95Dev recommends putting up images of high quality. Moreover with image search being popular these days in finding products online, it is smart to add associated keywords into the Alt tags to boost search rankings. Internal links are links that go from one page on a domain to another page on the same domain. They primarily help users to navigate and establish an information hierarchy for a website. But importantly, they empowers ranking around website. Enticing inbound links are crucial components for powerful SEO strategy. Hyperlinking your product pages/exciting offers or some valuable blogs in your home page helps improve search engine ranking. Appropriate URL structure help search engine robots to find and crawl your site easily to identify what your site is about. Redirecting URL helps the merchant to ensure that shoppers flawlessly land on the desired page. Keyword friendly or speaking URLs help the customers to know what to expect when they click on the URL. i95Dev recommends keeping important keywords in the anchor tag if the URL is used as the anchor text since it points back to your website and helps to top the search engine rankings. PPC is a very important and powerful tool to help you stand out from the crowd. All your SEO efforts are critical but they are part of a long term strategy. PPCs can help you get noticed very quickly but they come at a price, and hence must be used judiciously. If overdone can leave a big hole in your Marketing budget with very little ROI and if used judiciously can drive enough traffic to your website in no time. 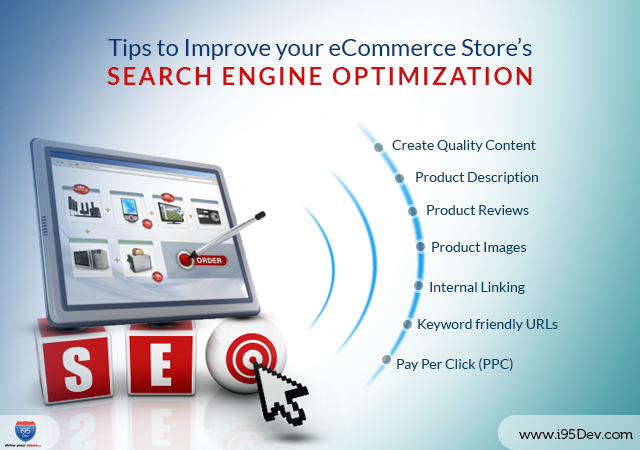 Also read our blog 10 SEO Tips for the Success of Your eCommerce Business for more SEO tips for your ecommerce website.